KwizFun is an exciting new mobile game platform providing real-time multi- player custom trivia games and services. Games are played Team-Against-Team in a fun, live environment. The KwizFun team provides services to enable nonprofit and community organizations to raise funds, advertisers to reach an engaged audience and much more. The Trivia Event will be a lively, fun and festive atmosphere that will feature food, music and a KwizFun Trivia game line-up. Each game will be themed, consist of 10 questions and take approximately 10 minutes to play. There will be an emcee to guide the players through the evening’s games (and play music) but the emcee will not read the questions. The line-up of Trivia games will begin at the 6:45 pm with a demo game. The Trivia Event itself will begin at 7 pm. This event is free. 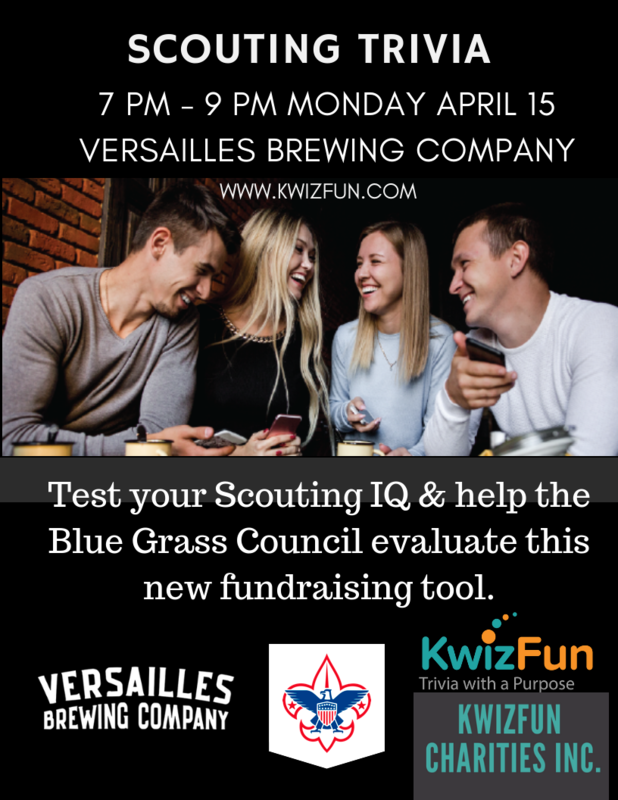 Come to the Versailles Brewing Company and play. To play you will need to download the free KwizFun mobile app from the App store or Google Play and register. Registration can be done before you arrive and takes just a couple minutes. DOWNLOAD the free KwizFun Mobile App from the App Store or Google Play. Sign in or create an account if you haven't played before. The app will ask you for a team name when registering. If you have played before and wish to change your team name (Go to manage my team and edit your team name). CHECK IN. When you arrive at the event, check in with KwizFun staff so we can record your KwizFun team name and your phone number. FORMAT: KwizFun Trivia games are short, themed games. Each game has 10 questions, 4 rounds, and takes 10 minutes. EACH PHONE IS A PLAYER. You can collaborate as a group. TEAM PLAY: In Team play, each game is considered a round. The Team score for each round is the best score of all the teammates for that game (think of "best ball" in golf). HOW TO PLAY - The questions will begin to appear on the KwizFun mobile app shortly after the start time. The game plays quick and we don't read the questions. Each phone is a Player. Groups can collaborate. Groups of two or more can register for team play. Once a question appears, you will be given 20 seconds (most games) to choose an answer. Best practice is to answer quick, then modify as necessary. No need to press a submit button, your last selection is that one that will be accepted.